A rainbow is the much loved multi-colored arc we sometimes see in the sky after a sun shower. A rainbow forms as a result of reflected and refracted light in drops of water in the atmosphere. Simple science projects and experiments help students understand this phenomenon responsible for our color spectrum. Rainbows are formed as a result of light bending as it passes through something. To illustrate the bending of light, you will need a pencil and a glass of water. Set the pencil in a glass of water, but do not completely submerge it. You want part of it sticking out of the water. Look down into the water from directly above the glass, and then look through the side of the glass, being careful to notice the way the shape of the pencil appears to change and shift. This happens because the light passing through the glass and water is being bent. It hits your eyes at different angles and causes visual distortion. You will also notice that the part of the pencil in the water is magnified. The pencil will look bigger as the volume of water between you and the pencil increases. Try illustrating this with different-sized glass vessels. Although we often think of light as “white,” it is actually made up of many colors. This project breaks light into the seven different colors we see in the rainbow. You will need a clear glass of water, two sheets of white paper, a chair and a flashlight. Fill the glass slightly more than half. Set it on the edge of the chair so that it rests with half of the bottom of the glass on the chair, and half off. Lay the sheets of paper next to each other on the floor under the glass. Shine the flashlight through the glass at water level, pointing the beam toward the paper. You will notice a rainbow pattern appears on the white paper. When the light hits the glass, it bends slightly, breaking the light into colors because each color bends at a different angle. 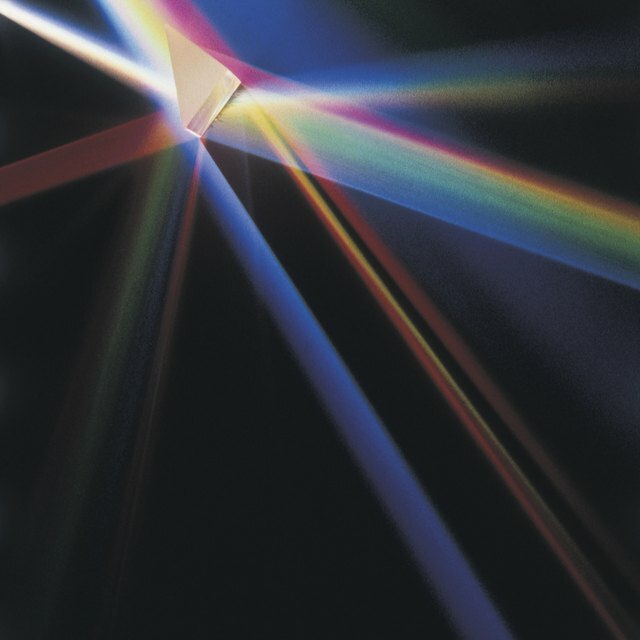 You have just created a type of prism. In the same way a prism refracts light, raindrops also bend the light to create the rainbows we see in the sky. You can create a rainbow in the same manner as raindrops. Go outside on a sunny day. Stand with the sun behind you so that you can see your shadow in front of you. Turn your garden hose nozzle to the setting that makes a mist or fine spray. Turn the hose slightly; you are trying to find just the right angle for the sun to hit the water. When it does, a rainbow should appear above the water. The light passing through the water is being refracted (bent) and separating light into visible colors. 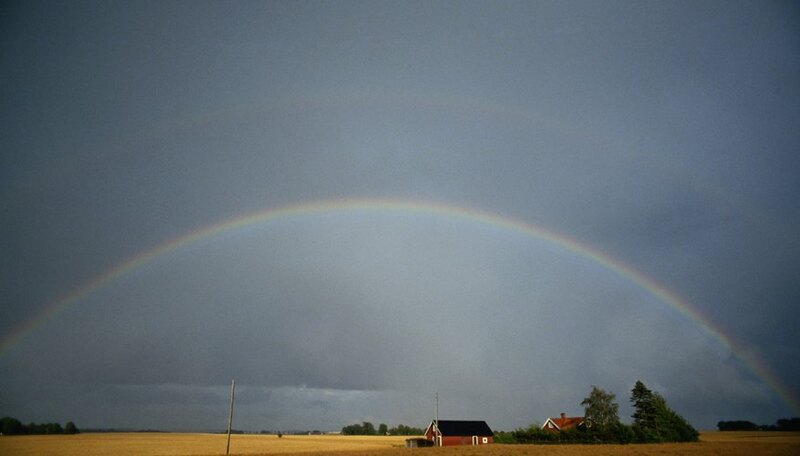 The rainbows we see in the sky are actually full circles, but we can only see a portion of them. You can measure the angular radius of a rainbow. When you see a rainbow in the sky, go outside and pin an index card onto a tree, making sure the pin is large enough to project from the tree. Turn the card so that its top edge points to the top of the rainbow. Notice the shadow of the pin. Draw a straight line that runs through the top of the card and touches the bottom of the pin’s shadow. Measure the angle created with your drawn line and the line of the top of the card. The angle should be 42 degrees. This is the angular distance of the rainbow to the antisolar point, or the point exactly opposite the sun. During times when the sun happens to be more than 42 degrees above the horizon, you will not see a rainbow. However, if you stand on a hill, you may be able to see more of the circle. At times, airplane passengers can observe a full circle. McCarson, Debbie. "Science Projects About Rainbows." Sciencing, https://sciencing.com/science-projects-rainbows-15568.html. Accessed 18 April 2019.